Patagonia is a leader in streamlined design, and their newly-released Middle Fork Waders are a hallmark for that commitment. Despite knowing that these waders were conceived and built to be ultra-light, it still doesn’t lessen the surprise of unpacking them for the first time – they’re otherworldly light. Expectedly, materials are reduced to the bare essentials: there’s support via minimalist, adjustable and stretchy suspenders and wading belt (fitted with a secure clamp-down mechanism). The upper body is built from 3-layer, H2No high performance fabric with a waterproof/breathable barrier and a DWR finish, seat and legs are 4-layer, 4.5-oz 100% polyester, including heavy-duty scuff guards. The entire package boasts newly developed seam tape and single-seam construction (thousands of R&D hours, as per the press release – entirely believable upon close inspection). Seat and legs offer a great fit via articulated flex points. 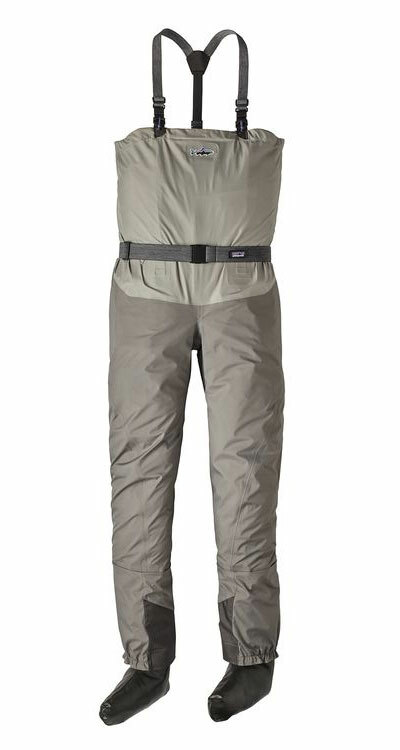 Waders generally constitute large, heavy gear that you want to remove the moment your fishing day ends. Conversely, there are moments you just about forget you are wearing these. Middle Fork waders even assist when they’re not worn: in hiking and air travel, size and weight matter, and at their most compact crushed-down volume, they’ll allow for extra backpack or luggage space. These can easily qualify as your primary waders for warm water wading, or just a second take-a-long pair for when the temperature makes an unexpected turn upward. If you’re carrying a camera or PCD, the interior TPU-welded, a waterproof pocket rounds out this outstanding package. Finally, step back to consider everything that Middle Fork waders offer, then factor in pricing and you quickly realize that they constitute one of the best wader values currently available.